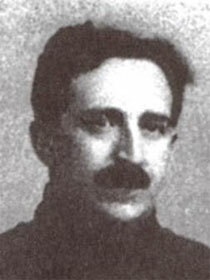 Alexander Krein (1883-1951) was one of the leading modernist composers of the Soviet Union in the 1920s and 1930s. He was born in the Russian city of Nizhni Novgorod into a family of traditional Jewish folk musicians. His father, Abraham, was a folk violinist, seven of whose ten children became professional musicians, notably David (1869-1926), the concertmaster of Moscow’s Bolshoi Theater orchestra, and Gregory (1879-1975), also a composer, in addition to Alexander. After a childhood spent performing in his father’s band, playing klezmer music (East European Jewish folk music), Krein entered the Moscow conservatory at age thirteen as a cello student. He went on to study music theory and composition with composers Sergey Taneev and Boleslav Yavorsky. While still a student, he began to compose song settings for Russian and French symbolist poetry. By the time he graduated in 1908, he had developed a highly original style, one which combined the new harmonic language of modern composers such as Debussy, Ravel, and in particular, Scriabin, with the lyrical melodies and distinctive modes of Jewish folk music. This piece represents one of his first efforts in this direction, and forms part of a two-set series of Evreiskie eskizi (Jewish Sketches) for clarinet and string quartet (1909 and 1910) based on melodies from his own father’s klezmer repertoire. It was written at the behest of composer Joel Engel, who encouraged Krein to explore his own Jewish musical heritage. Published by the Moscow-based Russian music publisher Jurgenson, the piece earned immediate acclaim, establishing Krein as a major new voice in both Russian and Jewish music. Krein played a major role in the emerging school of Jewish national music as a composer and active member of the Society for Jewish Folk Music’s Moscow Branch (1913-1919) and its successor organization, the Society for Jewish Music (1923-1929). In the Soviet era he served in a variety of roles in the Music Section of the Soviet Ministry of Education and later the editorial board of the State Music Publishing House. Beginning in 1917 he composed extensively for the theater, including Moscow’s Hebrew-language Habimah Theater and the Moscow, Ukrainian and Byelorussian State Yiddish theaters. During the 1920s he wrote several important works, including the symphonic cantata Kaddish (1921), the First Piano Sonata (1922) and the First Symphony (1922-25). In these compositions Krein embraced both Jewish folk and liturgical melodies as part of his search for a distinctive, non-European Jewish sound. As the Communist regime grew more and more ideologically restrictive in the late 1920s and 1930s, Krein struggled to reconcile his art with the increasing political pressures. In spite of obvious political compromises in the form of works such as the cantata Funeral Ode in Memory of Lenin (1926) and the symphonic oratorio The U.S.S.R.—Shock Brigade of the World Proletariat (1932), Krein continued to boldly explore Jewish musical and literary themes in his work well into the 1940s. His opera Zagmuk (1929) concerned the Jewish uprising in ancient Babylon and was staged as the first Soviet opera at the Bolshoi Theater in Moscow (1930). In 1934 he was awarded the title of Honored Artist of the Soviet Union. As late as 1941 Krein composed music for the productions of the Moscow State Yiddish Theater and his Second Symphony (1945), a meditation on the historic sufferings of the Jewish people from ancient times through the Holocaust.